hi guys! back again with another Festive Friday project. 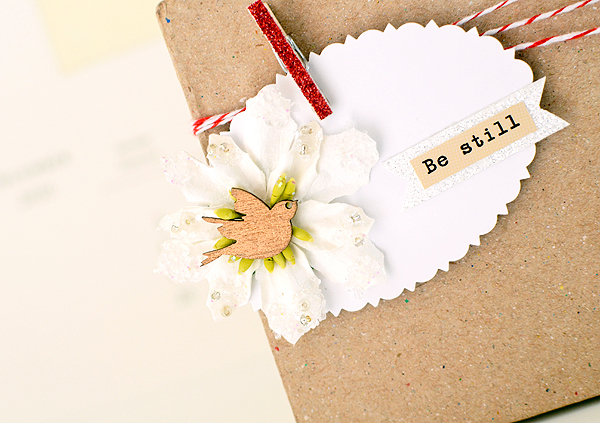 Such a lovely inspiration photo this week so you should definitely try to play along! 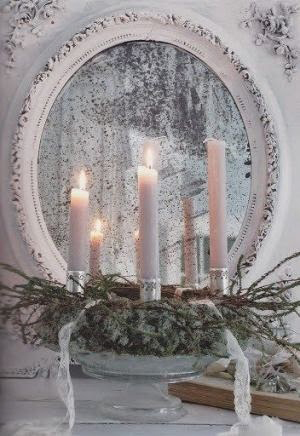 the photo is simple on the surface--just some candles and evergreens against a pretty mirror--but a longer look reveals much more. 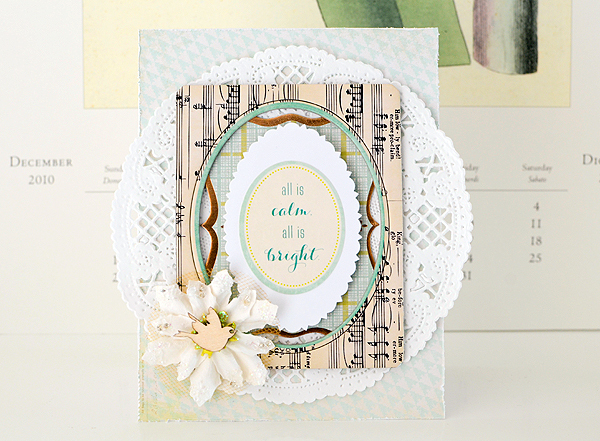 there are so many things to spark inspiration: the colors (of course:), the shape of the mirror, the way it looks a little tarnished, the softness and peacefulness of the composition...i drew from all of those things to create my card. 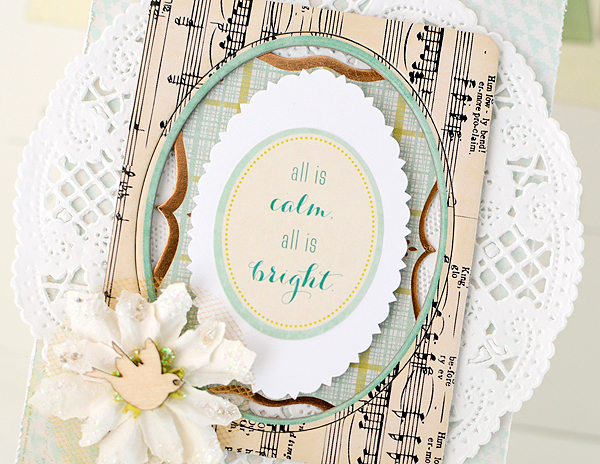 i wanted to keep the soft colors, first of all, so i chose a light aqua background paper. the stillness of the photo had a lot to do with my choice for the sentiment, too. 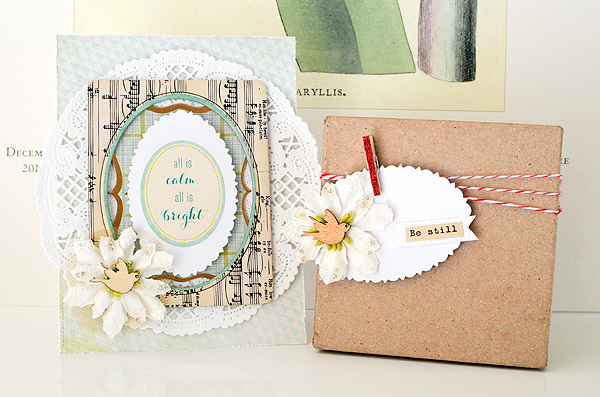 the background paper, sentiment sticker, and chipboard frame are all from Crate Paper's Sleigh Ride collection. 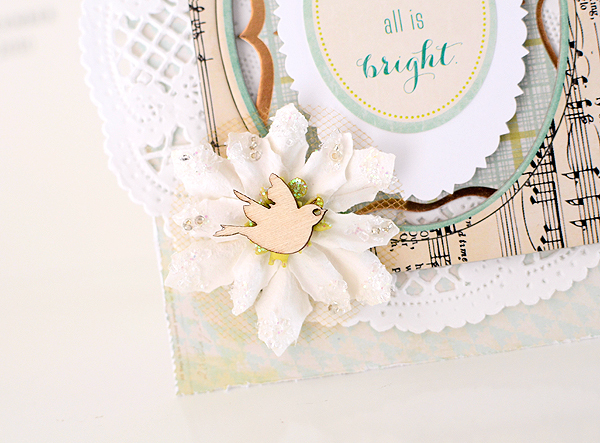 lastly, just a small "extra" touch with the wood bird against the white poinsettia and gold tulle. 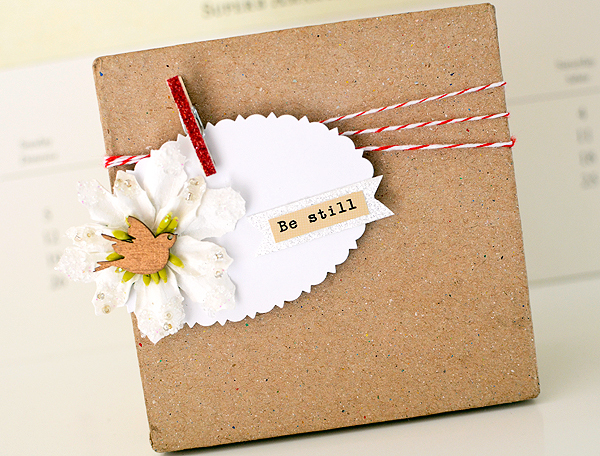 while i was messing about with the idea for the card, i came across the "be still" sticker and liked it for the card. but after trying a few different placements, i couldn't make it work. no worries, though, i just turned it into the sentiment for a matching tag. i apologize for the overexposed look of my photos this week...when there isn't a lot of contrast on the object i'm shooting, i seem to find a very thin line between overexposed and too dark and dull. on a different note, i recently added a few Easter items to the Etsy shop and i'll be back here later this week to share them with you. i've also got a few more cards that i haven't posted yet so i'll be sure to get those up, too. i promise not to be a stranger this week! i truly appreciate the comments you guys have been leaving, too. you have no idea how much they really mean to me...thank you so much!